What's happening with passenger rail? Our 32-mile long rail corridor extending from the Pajaro Junction adjacent to Watsonville (where it connects with the coastal main line used by Union Pacific and Amtrak—see the map) northward to Davenport, was acquired from the Union Pacific Railroad by our Regional Transportation Commission (RTC) in October 2012. The $14.2 million purchase—unanimously recommended by the RTC in May 2010—was made primarily using the $22.5 million dollars available through (a) the passage of State Proposition 116 in 1990 by California voters—including a majority of Santa Cruz County voters ($11 million), (b) State Transportation Improvement Program funds ($10 million), and (c) a Federal grant obtained by Congressman Sam Farr (($1.5 million). Additional details, including conditions of purchase, are available from the RTC's website by clicking here. The funds provided through Proposition 116 are mandated to be used to facilitate passenger and/or freight rail service on the line. It is fortunate that this rail corridor exists. The first train to travel along the tracks—linking Santa Cruz with Watsonville—ran on May 7, 1876. The restored steam locomotive Jupiter~3 (which powered the train) is currently on display at the Smithsonian Institution. For more information, click here and here. Since the corridor provides an alternative mode for transportation that is roughly parallel to Highway 1, it could serve as a beneficial multi-modal transportation corridor. 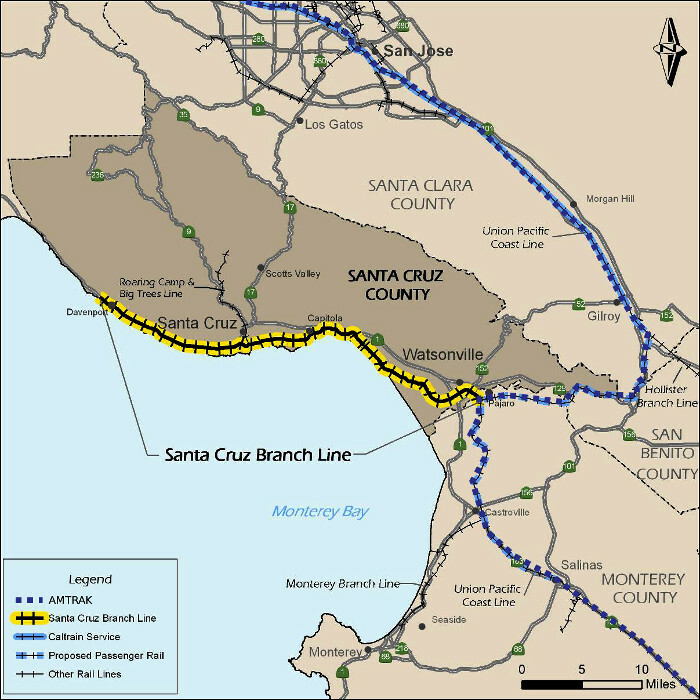 The rail corridor passes through the most populated areas of Santa Cruz County between Santa Cruz and the Pajaro Junction. The population density along the corridor is surprisingly high, with roughly half of our population being located within a mile of the tracks. 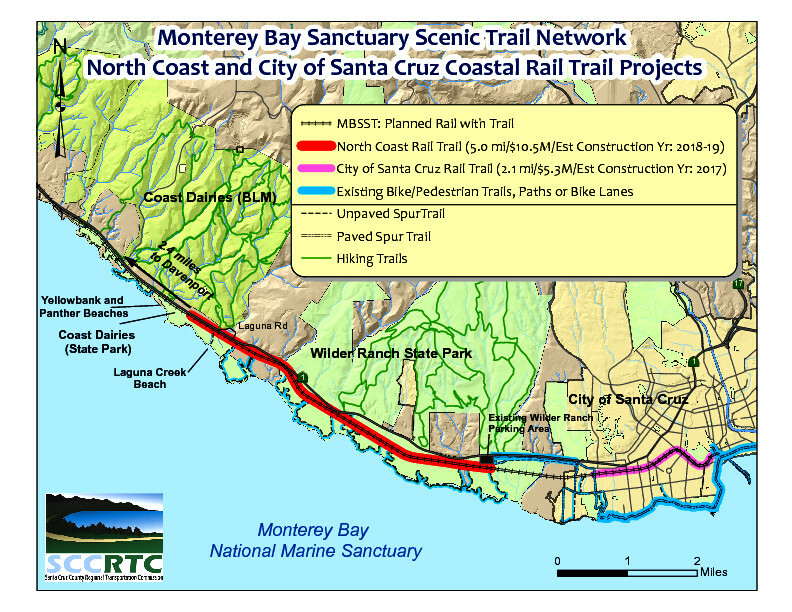 Consistent with the RTC's goal to expand transportation use of the corridor, on November 7, 2013, the RTC adopted a Master Plan for the Monterey Bay Sanctuary Scenic Trail Network (MBSST), which includes a bicycle and pedestrian trail within the rail right-of-way (a rail trail adjacent to the tracks), as well as other connecting coastal trails and on-road facilities. Public interest in a bicycle and pedestrian trail lying within the rail corridor is clearly strong, and funding for the construction of initial segments of the trail has been allocated. 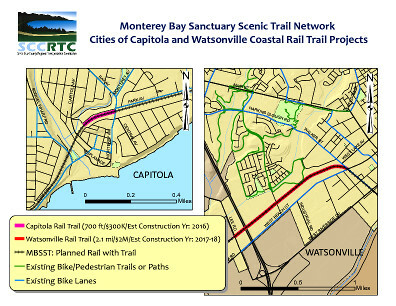 Furthermore, three other segments of the Rail Trail have already received funding: (a) $4.06 million for the segment between Natural Bridges and Pacific Avenue within the City of Santa Cruz, (b) $300,000 for a short piece in Capitola from the Upper Pacific Cove parking lot to Monterey Avenue and (c) $1.04 million for the segment connecting Lee Road east to the slough trail connection within the City of Watsonville. The maps show the currently funded sections of the trail. Click on either map to enlarge it. Further details are availablehere. A Draft of a Passenger Rail Feasibility Study was released in May 2015 by our Regional Transportation Commission staff. The study was prepared by Fehr & Peers, LTK Engineering Services, RailPros and Bob Schaevitz. It is available by clicking on this link. As noted in the 15-page Executive Summary (available here), the study, which analyzes seven sample scenarios, concludes that passenger rail service is feasible. The sample rail transit scenarios estimate a one-way fare of approximately $2.50 and headways of 30 minutes during commute hours. 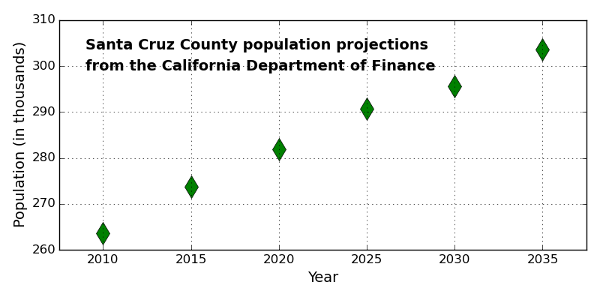 Weekday boardings for Scenarios G and G1 (Santa Cruz ⟺ Watsonville) are estimated to be approximately 5,500 when constructed (1.65 million per year), rising to over 7,500 by the year 2035. Capital costs for each of the scenarios range from $31.5 million for the Scenario S “starter” service (Santa Cruz ⟺ Seacliff) to $176 million for Scenario G1—the conventional locomotive-powered scenario for the full 20-mile service from Santa Cruz to Watsonville. Operation and Maintenance costs range from $3.7 million per year for Scenario J (Santa Cruz ⟺ Pajaro—weekday peak service) to $14.1 million per year for Scenario G1. Implementing passenger service on our rail line is way too costly. Why in the world would we spend so much just to get only a small number of travelers per day off of Highway 1? Travel times are predictable: As Fig. 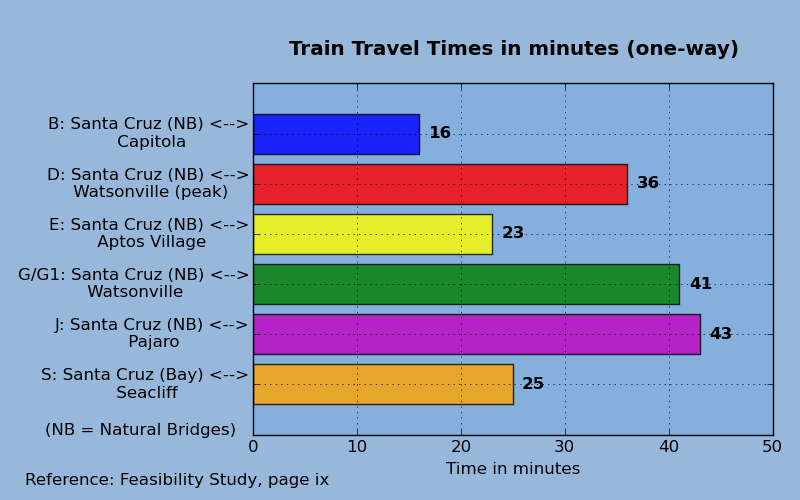 1 above shows, the train travel times are comparable to the car travel times on Highway 1, especially if there are traffic jams. Furthermore, those train travel times come with set schedules, and are not affected by highway traffic jams. If you're headed to a job, or to a class, you don't have to factor in the uncertainties of car travel. You'll know when the train leaves and when it arrives, and you can plan accordingly. Some destinations would require shuttle or bicycle connections. Passenger rail is scalable: The capacity of passenger rail and freight modes can expand more easily as the population increases, compared to increases in the capacity of Highway 1. Rail use is scalable. More travelers on the rail line may be accommodated primarily by adding additional rail cars. (Some expansion of station capacities may be appropriate.) To accommodate more autos on Highway 1 requires the addition of expensive highway lanes, including new interchanges for through lanes, and added lanes will not be effective for long. Travelers take up less space in a rail car: The capacity for travelers in a rail car is far more compact than the capacity for travelers in vehicles on a highway, especially for single-occupant vehicles. Passenger rail benefits seniors, youth, students and longer distance travelers: Over a third of our population do not drive cars, and that fraction is increasing. Passenger rail, like other public transportation modes, provides a way for those who do not or cannot drive to get from one place to another. Passenger rail and other modes—such as bicycles—can be combined to extend travel distances. Rail cars are less polluting and reduce global warming: Rail cars, especially Light Rail Vehicles (LRVs), or Electric Multiple Units (EMUs) are much less polluting than highway vehicles, and can therefore reduce the impact on global warming. The rail car technology is advancing rapidly. 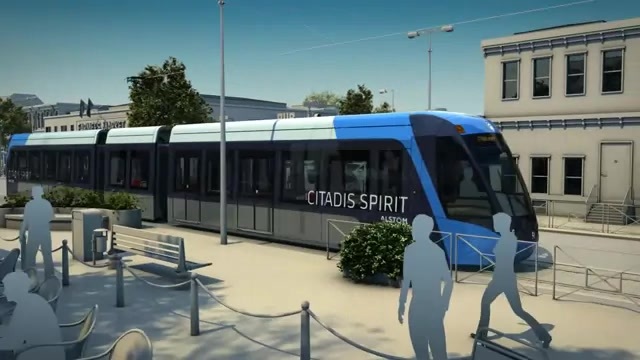 Try watching this video—an informational video about Alstom's new Citadis Spirit, due to become operational in 2018 in Ottawa. Alstom is the second largest manufacturer (behind Bombardier) of LRVs in the world. For additional information about Alstom's Citadis Spirit, check out this brochure. Note that these vehicles may be catenary-free, that is, without overhead wires. Furthermore, unlike the Siemens S70 vehicles shown below, they are 100 percent low floor, which is attractive both for those in wheelchairs and those with bicycles. 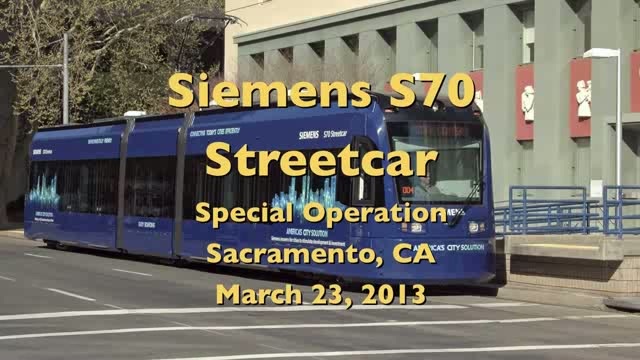 Their maximum speed (65 mph) is also greater than that of the Siemens S70 (40 mph). Finally, they are remarkably efficient in their energy use, up to twenty times as efficient as the average passenger car in the U.S. Passenger rail and highway traffic dynamics: The implementation of passenger rail can work to make use of the rail line an attractive option, providing an escape valve for those who repeatedly find themselves stuck in traffic on Highway 1. To gain an understanding for this point, it helps to understand the dynamics of traffic flow on a highway. On a highway, the transition from traffic jam to freely flowing traffic is a phase transition. Such a transition occurs at a critical point (also called a tipping point). It happens suddenly. At the critical point, a small decrease in the density of vehicles on a highway can transform a traffic jam into freely flowing traffic, much as solid ice transforms to fluid water when the temperature is raised slightly. 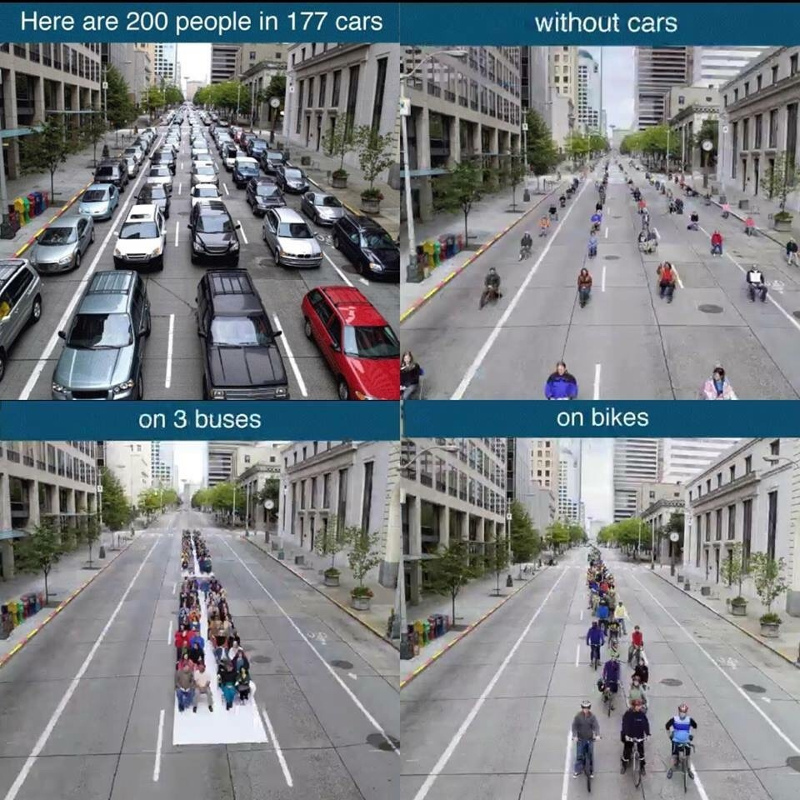 Thinking about these analogies, we can conclude that decreasing the number of vehicles slightly on the jammed highway will cause the disappearance of the traffic jam. While a transfer of only a small number of travelers from the highway to the rail could, in the short term, relieve jams on the highway, the long term effect is more complex, since a highway without traffic jams will attract more vehicles to the road. After some time, a new equilibrium point may be achieved, in which the highway will be at near capacity flow for some periods, but will likely still experience occasional traffic jams. However, there will also be new travelers on the rail line. What about the problems of noise and vibration resulting from the frequent passage of trains on the rail line? 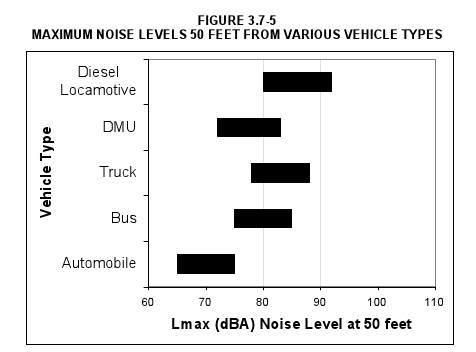 This figure, prepared for the Sonoma-Marin Area Rapid Transit (SMART) implementation, shows that a DMU is quieter than an ordinary Diesel-powered bus. (The full document from which this figure was obtained is here.) Such DMUs, such as the Swiss-made Stadler GTW, are currently in use on several commute lines in the U.S. A photo of a typical DMU is here. A thoughtful recent blog from Seattle is here. These are available, and could be installed on our vehicles. Furthermore, Quiet Zones can be mandated, which reduce train horn sounds in locations with enhanced crossing equipment. Federal regulations prohibit the use of light rail vehicles on the same track with freight trains. That seems like a show stopper. How can this problem be addressed? The Federal Railroad Administration (FRA) prohibits the sharing, on the same track, freight trains with light rail vehicles. However, if there can be separation by time of day between the two types, a waiver to the rule can be granted by the FRA. The space for a pedestrian and bicycle path seems too narrow in many places. Can't we just remove the tracks so as to provide the needed space? First of all, based on the informational right-of-way maps, approximately 94 percent of the corridor is at least 32 feet in width, and will easily accommodate both the rail tracks (20 feet) along with a full width trail (12 feet). Of the remaing 6 percent (two miles), about one and two-thirds miles is greater than 25 feet wide, most of which will accommodate the rail tracks along with at least an 8-foot wide trail. Less than one-third of a mile, in small pieces at various locations, is narrower than the absolute minimum of 25 feet needed for a rail-with-trail system, but solutions have been identified. Second, it would be legally difficult. By agreement, the funds supplied through Proposition 116 must be used to enhance rail travel (freight and/or passengers) on the line, so removal of the tracks would be contrary to that agreement. Furthermore, Iowa Pacific, the carrier that currently runs the seasonal rail service, has another seven years left on their contract to do so and they have no intention of giving up their rights under that contract. Moreover, it is highly unlikely that the federal agency that must approve decommissioning the rail service would do so unless there was no rail carrier willing to step forward to provide passenger and freight service even after Iowa Pacific’s current contract expires. We have been told that the federal agency was formed to protect the rights of rail carriers, first and foremost, so decommissioning existing rail lines is not a easy accomplishment. Aside from that, the removal of the tracks and the redesign of the trail would be an expensive and involved process, and very likely would retard construction of the trail. We would not be able to plan and construct the trail any faster. Moreover, we would lose the advantages of the rail passenger service described above. 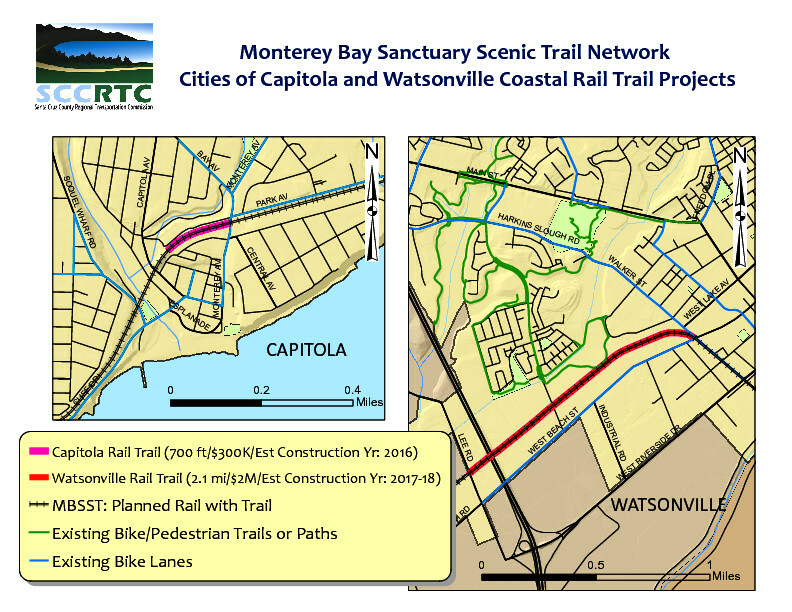 The Capitola trestle seems to be a real problem, since reportedly, it cannot accommodate a pedestrian and bicycle path in addition to the rail line. This seems like a stopper for the rail trail. What can be done about that? Indeed, the rebuilding of the Capitola trestle (which actually has five parts) will likely be a difficult and expensive undertaking. Eventually the trestle will need to be reconstructed, and the most likely source of funding for that is actually grant money for rail projects. In the interim, there will be a gap. When funding becomes available and this gap is prioritized, a new single bridge accommodating both rail cars and a trail can be constructed. Keep in mind that the complete trail is being funded and built segment by segment, which means it will take some time before we have long sections of continuous trail. By then we should have a new trestle over Capitola. When the La Selva trestle was reconstructed in February, 2015, no bicycle and pedestrian path was incorporated. Why not? This seems like a missed opportunity. Part of the purchase of the rail corridor involved an agreement with Iowa Pacific that all parts of the rail line be in good working condition. The La Selva trestle was in very poor condition and needed to be replaced. Unfortunately, funds were not available to include a facility for bicycles and pedestrians in the reconstruction of the trestle. As funds become available, a separate bridge for bicycles and pedestrians will be constructed adjacent to the existing trestle. 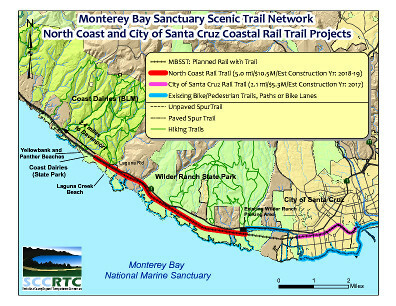 For additional information, see Page 4-83 of the Monterey Bay Sanctuary Scenic Trail Master Plan. Section 4 of this plan (a 20 MB document) is available here. The Draft Passenger Rail Feasibility Study recommends further consideration be given only to Scenario E (Santa Cruz ⟺ Aptos Village) and Scenario S (Santa Cruz ⟺ Seacliff), neither of which would serve the south county, Watsonville in particular. Wouldn't it make sense to consider recommending service to Watsonville? Section 8 of the Feasibility Study provides additional discussion, leading to the designation of the “preferred alternative service plans”: Scenarios E (option 1) and S (option 2). Of these two, the Study notes (Page 131) that “If and when funding becomes available, Scenario E can be expanded to Scenario G… ”. Presumably Scenario G was not chosen ahead of Scenario S because of its higher cost, and the funding for this scenario may not be sufficiently available in the short term. Here is a proposal that would implement Scenario E (Santa Cruz at Natural Bridges to Aptos near Cabrillo) with the intention for eventual extension to Watsonville as funds become available. This proposal would use electrically powered Alstom Citadis Spirit vehicles—the type that have been chosen for Ottawa's O-Train Confederation Line, described in the video above. (The Passenger Feasibility Study recommends initially pursuing the use of DMUs, rather than electrically powered vehicles, presumably because the needed electrification of the line is judged to be too expensive. However, electrically powered vehicles contribute less to global warming, and may be quieter, so they should be considered from the start if possible.) As mentioned earlier, Alstom is a world-wide leader in the manufacture and installation of all kinds of rail systems. Vehicles would be made in the USA. The Citadis Spirit vehicles are low-floored LRVs—also called trams—of excellent long-lasting design. Their use would require the electrification of approximately eight miles of track, possibly catenary-free, i.e., without overhead wires. Our proposal envisions the acquisition of five vehicles initially, at an estimated cost of $4 million each. This would enable two trainsets of one or two vehicles each, plus one spare, so the vehicle cost would total approximately $20 million. This piece was put together by members of The Campaign for Sensible Transportation, including Jack Nelson, Piet Canin, Amelia Conlen, Bruce Sawhill and Peter Scott. What do you think of our “Proposal for a passenger train”, outlined above? Does it merit further study? Please write to us by clicking here. Comparing the fuel efficiency of Light Rail Vehicles with that of automobiles can be tricky. One wants to compare the energy required to move a person a certain distance (such as a mile or a kilometer) for a typical automobile with a typical electrically-driven LRV. It seems a simple question, but accurate data are hard to come by, especially for the latter. The energy required to move a person in either an automobile or an LRV is inversely proportional to the occupancy of the vehicle, i.e., the number of people in the vehicle. While we have a good idea of the typical occupancy of a private automobile (it varies from about 1.1 for commuters to work to about 2.0 overall), a typical LRV may have twenty or forty or more of its available seats occupied—a number that is hard to confirm. Moreover, an LRV may use regenerative braking, which affects the net amount of energy required to power it.